Princess Carolina, his sister (who at the time was an adult aged 22, while he was still a minor at 17), from 1765 to William's majority in 1766. William was made the 568th Knight of the Order of the Garter in 1752. William V assumed the position of stadtholder and Captain-General of the Dutch States Army on his majority in 1766. However, he allowed the Duke of Brunswick to retain a large influence on the government with the secret Acte van Consulentschap . On 4 October 1767 in Berlin, Prince William married Princess Wilhelmina of Prussia, the daughter of Augustus William of Prussia, niece of Frederick the Great and a cousin of George III. 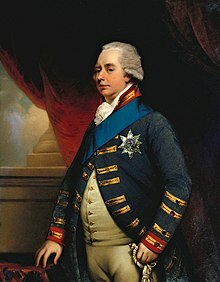 (He himself was George III's first cousin). :55-58 He became an art collector and in 1774 his Galerij Prins Willem V was opened to the public. The last of the Dutch stadtholders, William V died in exile at his daughter's palace in Brunswick, now in Germany. His body was moved to the Dutch Royal Family crypt in the Nieuwe Kerk in Delft on 29 April 1958. In 1813, his son, King William I returned to the Netherlands and became the first Dutch monarch from the House of Orange. An unnamed son (23–24 March 1769). Frederika Luise Wilhelmina (The Hague, 28 November 1770 – The Hague, 15 October 1819), married in The Hague on 14 October 1790 Karl, Hereditary Prince of Braunschweig (London, 8 February 1766 – Antoinettenruh, 20 September 1806), a son of Karl Wilhelm Ferdinand, Duke of Brunswick-Luneburg and Princess Augusta of Great Britain, without issue. An unnamed son (born and deceased on 6 August 1771). William I, King of the Netherlands (25 August 1772 – 12 December 1843). Willem Georg Frederik, Prince of Orange-Nassau (The Hague, 15 February 1774 – Padua, 6 January 1799), unmarried and without legitimate issue. Orange County, Indiana was named after the North Carolina county. 1 2 3 4 5 6 7 8 9 10 11 12 Schama, Simon (1992). Patriots and Liberators. Revolution in the Netherlands 1780-1813. Vintage books. 1 2 Israel, J.I. (1995). The Dutch Republic. Its Rise, Greatness, and Fall 1477-1806. Clarendon Press. ↑ James, W.M. (2002). The Naval History of Great Britain: During the French Revolutionary and Napoleonic Wars. Vol. 2 1797-1799. Stackpole books. pp. 309–310. ↑ Genealogie ascendante jusqu'au quatrieme degre inclusivement de tous les Rois et Princes de maisons souveraines de l'Europe actuellement vivans [Genealogy up to the fourth degree inclusive of all the Kings and Princes of sovereign houses of Europe currently living] (in French). Bourdeaux: Frederic Guillaume Birnstiel. 1768. p. 88. ↑ Cobban, A. (1954). Ambassadors and secret agents: the diplomacy of the first Earl of Malmesbury at the Hague. Jonathan Cape. p. 23. ↑ Meerkerk, E. van (2007). "De laatste stadhouder. Willem V (1748-1806) in: Historisch Nieuwsblad 10/2007". Historisch Nieuwsblad (in Dutch). Retrieved May 11, 2018.